With so many exciting and enriching toys on the market, finding the right one for your one-of-a-kind child can be a time-consuming project. To streamline your search, we put together this list of 20 special toys that we hope will be a match your wonderfully unique toddler. We broke them down by general age-appropriateness, however we believe that many of these interesting creations will have a long and happy life in your child’s playroom. Whether these toys help your child grow her musical skills, math skills, visual-spatial skills, problem solving skills, science skills, social skills, story-telling or imaginative skills, they are sure to support your child’s natural desire to explore, learn and grow through the act of play. This interactive microphone is a unique twist to the traditional toy. 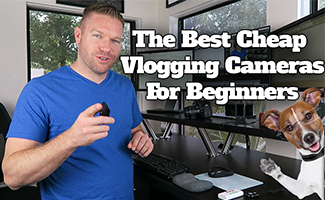 Amplifying your child’s voice is just the start. 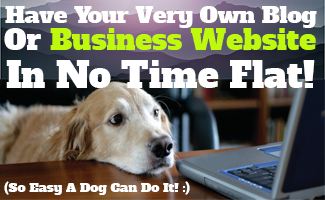 Pressing the puppy botton activates 60 songs, phrases and sounds to sing with, move to and groove to! Shake the microphone to hear it rattle and make sounds. Turn the white ring and you will hear 12 animal sounds. 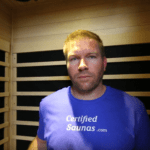 It also offers melodies in rock-n-roll and classical style. 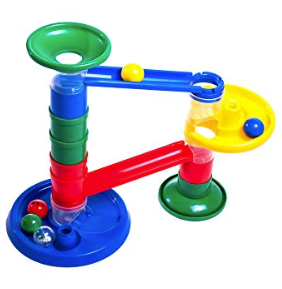 The festive colors and ribbons backed by solid construction make this toy very attractive to the youngest of toddlers. We really like this toy because it supports melodic intelligence and a rhythm. It has a variety of songs to listen to so it allows for a longer play time. This toy will give lots of opportunities for role-playing and imaginative play independently and with others. It also helps to develop fine motor skills–pressing down on the buttons strengthens small fingers. It’s recommended that this unique, fun toy be used with adult supervision for children under 3 years of age. Solid and engaging, the 14-peice set can be put together in different ways: use only one ramp across, put the yellow swirl on top of the structure, or make a shoot that goes straight down. Vary the speed of the balls by letting them go one at a time or by releasing them as a group! 2 of the balls make happy rattling noises while another has a spinning mirror inside. 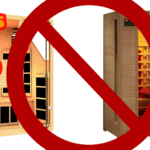 An original and interactive playset with a variety of activities. The zoo includes a measuring stick, pretend-scale, vision tester and hose for you to take care of the animals! Seesaw nests sit on the tree to rock the monkey back and forth. The wide swing sits ready to give either animals or little people a ride. The multi-level ramp rolls food down to the animals at feeding time. It includes a large chunky moveable elephant that makes sounds and plays music. It also comes with a small monkey, Zookeeper, Mia, 2 food pieces and attachable fence. We think this toy has lots of value because of its many features that lend itself to open-ended, unscripted creative play. Manipulating the large elephant and other figures helps build fine motor skills and coordination. Big Animal Zoo nurtures an attitude of care and respect for animals. 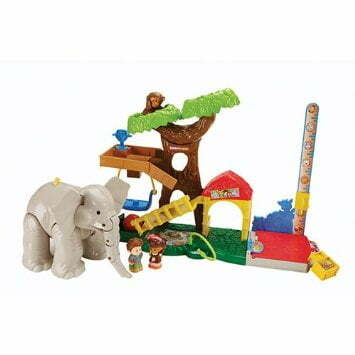 This toy is compatible with all other Little People toys, so you can add more animals, zookeepers and visitors to the scene to make your play setup one-of-a kind! A beautifully simple and inventive toy provides many ways to play. 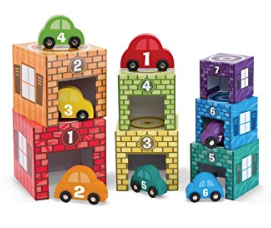 Kids can match the cars to garages by color or they can match them by number. The garages are graduated in size and stack on top of each other. The numbers on the boxes can serve as guides to making a stable tower. The wooden cars paired with the garages also go from large to small and make a car-stack as well. We think this is a noteworthy find because it teaches about size relationships, counting, and color matching. 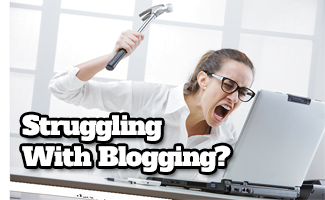 It helps kids strengthen problem-solving skills as well. This toy has a lot of open-ended pretend-play value–how many cars can fit in one garage? Will you build a town, city, or ellaborate parking garage? 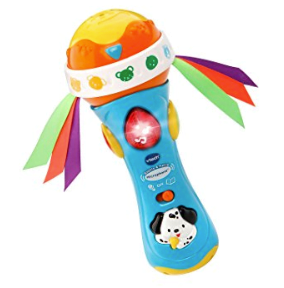 This singing and dancing toy has 3 different modes: in dance mode he shakes his hips and slides his head, encouraging toddlers to move right along! He has an LED light-up tummy for extra visual stimulation. 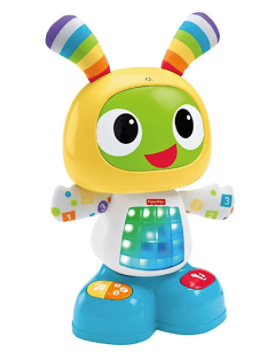 In Teach mode, BeatBo sings ABCs and 123s so kids can groove while learning. BeatBo can also record a phrase from you that he will remix and make into a unique song. We think this toy is wonderfully innovative because children can respond to it as enthusiastically as they would to a live dance partner! Many studies have shown that dancing increases confidence, coordination and social skills in young children. BeatBo is great to share with mom, dad or friends to have a dance party with! This Interactive toy also teaches cause and effect when your child sees what happens when they press different buttons. 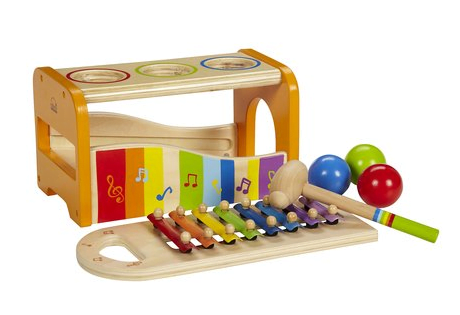 This notable and unique toy has a removable xylophone and 3 sturdy balls to pound. The balls are easliy pounded through the holes, so it is user-friendly for very young crowd. Made of non-toxic painted wood. 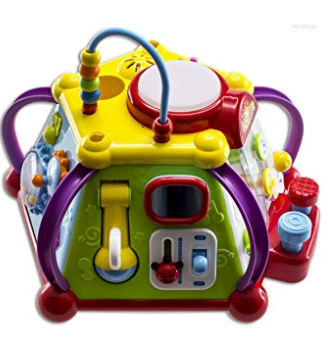 We find this toy valuable because it inspires musical development while providing audio and visual stimulation. It also encourages hand-eye coordination. While it is fun to pound the balls into the holes and listen to them play the xylophone while rolling down the hill, it also encourages experimentation. 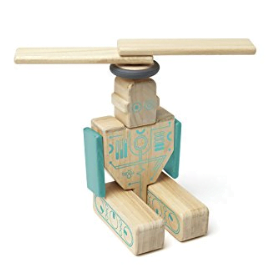 A toy that’s a fanciful new twist to traditional wooden blocks. Use this 9-peice set to create your very own robot! Your toddler will find it a magical treat as she discovers that these blocks stick together with the embedded magnets. Your child can challenge her creativity and see how many robot combinations she can come up with. Will it hold together or fall apart? 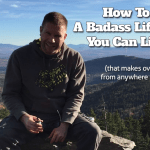 It’s all a big, fun experiment! Comforting to hold the smooth wood your hands, it comes from sustainably sourced trees in Honduras. 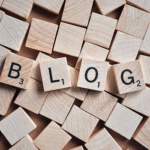 It is compatible with all other Tegu blocks. We think this toy is special because it leaves so much room for creativity and storytelling. A wonderfully colorful and unique toy that is jam-packed with activities. 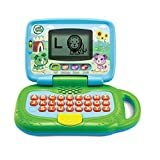 It has a cell phone for pretend play and a “screen” that shows different scenes from a child’s day. There is a small steering wheel for driving with a working horn and ignition sound. It holds a small karaoke machine complete with a microphone, volume control for the music, and speaker on top of the cube. It also has pull-strings, and water-filled gears with a ball toss that also controls the pace of the music. The package size measures 11.5 x 11 x 7 inches. We like it because it is such a joyful introduction to technology and cause and effect. It can promote a child’s sense of independence because there are many effects that the child can make happen. It also leaves plenty of room for open-ended and creative play. 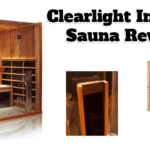 This Tube is deceptively simple, and remarkably exciting! Prop it up on a couch or table and watch cars, balls, and other small toys slide down through the clear window! Buy two and you can attach them to create an extra-long tunnel or have races with a friend. It is lightweight and easy to play with and measures 45 inches in total. 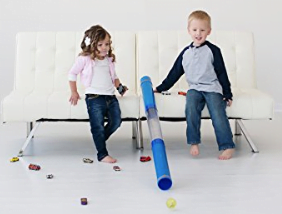 We think this uncommon toy is worth getting because your young child will be having so much fun that he won’t realize that he is learning simple physics by experimenting with an incline! Try sliding different toys down at different tube angles to see how fast or slow they will go. Because this toy lends itself so well to turn-taking, it will also support socialization. 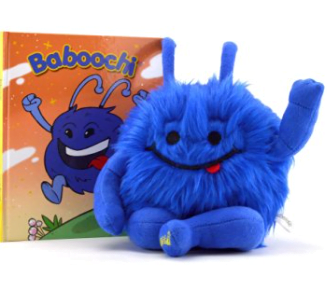 Baboochi is a whimsical plush critter that comes with a hardcover book featuring our blue friend practicing foundational and necessary life skills such as making his bed, being polite, and showing respect for others–whether they are family, friends, classmates or strangers. Baboochi is also an inclusive guy that can tolerate differences in others. We think this is a refreshing concept toy that kids can really establish an emotional connection with. More Baboochi books that will teach about kindness, caring and good habits are on the way! Kids warm up quickly to this toy and take him in as if he is an adopted sibling or special friend. 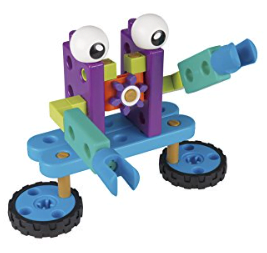 Baboochi’s arms are repositionable for more imaginative play possiblities. 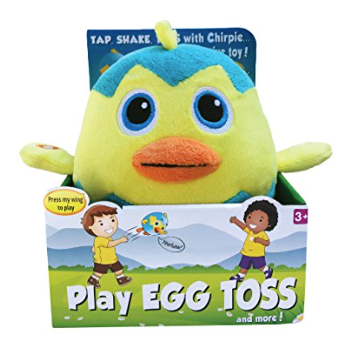 We find this toy so appealing because it nurtures active play, hand-eye coordination, and following direction in a playful way. It promotes plenty of socialization and also can “break the ice” between peers with jokes and funny phrases. This toy is great for very young children, but also lots of fun for older kids too! 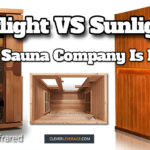 It provides a great way for younger and older siblings to play together. 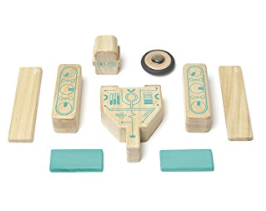 A toy that has 7 different ways to play, depending on child development. The foam boards can be made into an activity box or put on the floor to be used as a playmat. Adult supervision is required for very young children who might mouth objects. 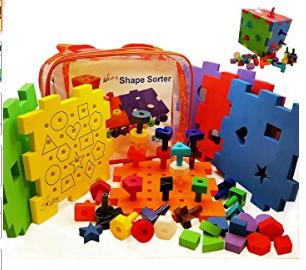 We think this toy is uniquely versatile because young children will enjoy the bright and chunky shapes and will have fun putting pieces in and dumping them out of the foam box that you construct. The toy will grow with your child and it can be used for color recognition, counting, sorting, shape matching. As your child further develops she can, build with the pegs. 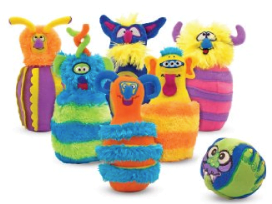 A bowling set never looked so cute with 6 plush and furry creatures to knock down and a soft easy-to-hold monster ball. It’s easy to stand them up and arrange in different formations. We think this game makes bowling exciting and fun! The pins can be used as dolls for imaginative play. It develops both large motor skills and fine motor skills and increases your child’s sense of balance. By counting how many pins are standing or lying down, it promotes preliminary math skills. And just like “grown up” bowling, this plush bowling set helps with socialization because it supports-turn taking when played with a friend. 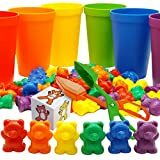 Recommended for children 3 and up..
A scrumptious way to build sorting and math skills, hand-eye coordination, and fine motor strength while having a blast with pretend-play. It includes 7 types of fruits in 5 colors and 60 fruits in total. The 2 super-grabbable and toddler-friendly tweezers not only make this toy easy to share with another, it adds a whole other dimension of challenge and fun. The fruit is made of rubber and the tweezers are plastic, so they are easily picked up. Comes with 3 double-sided sorting cards to put into the bottom of the pan for guided activities. . Adult supervision is recommended if there is a risk of putting small things in the mouth. 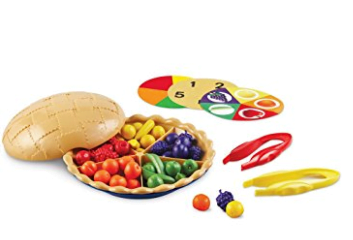 We think this toy is exceptional because there are a number of ways for kids to feel successful with practicing their skills of sorting, counting and picking up pieces with fingers or tweezers. It inspires plenty of pretend play and socialiization skills like sharing, cooking and eating together. 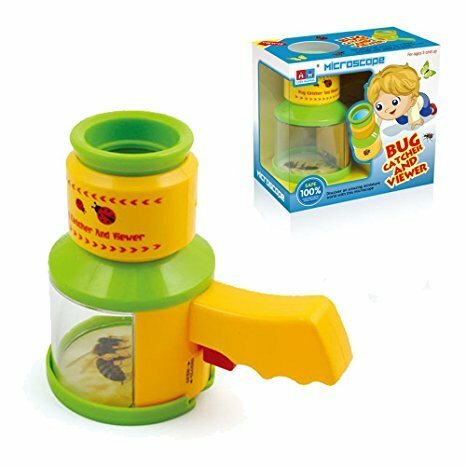 This ingenious little toy is a combination bug-catcher and microscope for your little one. Easily capture insects by squeezing the handle and opening up the bottom compartment. After your creature is safely inside, all you need to do is twist the ring on top to focus the magnifier and have a good look. After you are done observing, re-open the bottom and release the bug without touching or harmng it. Use this magnifier for observing other objects as well. 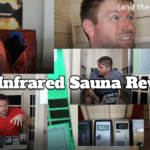 It has a rugged plastic construction that is hard to break and meant for the outdoors. We think this is a wonderful toy because it supports preliminary scientific observation skills and promotes appreciation of nature. This clever and original animal-themed 6-piece set is fun and easy to use. 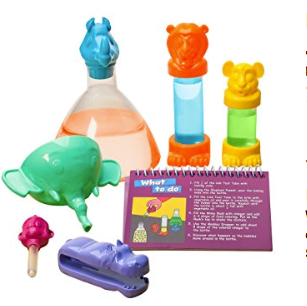 It includes small and large test tubes with cub and lion spouts, a flask with a rhino-cap, an elephant-shaped funnel, hippo-shaped tongs and a monkey eyedropper. 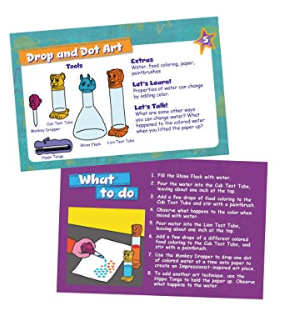 We think this lab collection is a must-have for your inquisitive toddler because it teaches the basics of STEM (Science, Technology, Engineering and Math) skills. It nurtures science skills by having you and your child observe what happens in each activity. It supports math skills because each experiment involves measuring and counting. Engineering skills come about as kids put together science and math skills. It helps with fine motor skills lsuch as pouring and using an eyedropper. 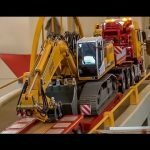 It will be a great toy for years to come because children can learn how to do the experiments independently or with friends. It comes with 10 experiment cards that call for things that can be found around the house or from the backyard. 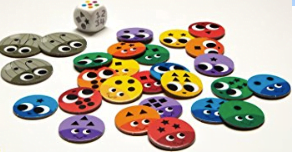 A matching game with novel twists and 3 levels to play! 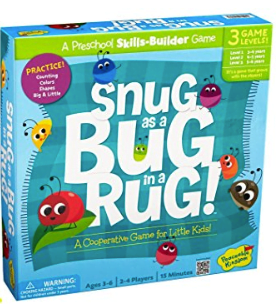 Bug in a Rug is a collaborative game where you and your child work as together to make matches and hide the bugs under the game board, or “rug,” before the 3 stinkbugs come out and make everything smelly. If your child and you can hide all of the bugs under the rug before the 3 stinkbugs appear on the board, you both win! Up to 4 players can play. There are no reading skills required for this lively and fast-moving board game, so it’s user-friendly for the very young. We think this game is a winner because it encourages workiing as a team, and when one person wins, all players win! It fosters observation skills while nurturing color, shape and size identification. It also promotes counting skills and fine motor skills by “hiding” the bugs under the rug. An exceptional toy that’s suited for 3 year-olds and up! The Robot Engineer Kit comes with a brighly illustrated story book about 2 kids that go on a journey to an automated candy factory and then buid robots to help the factory work better when they get there. 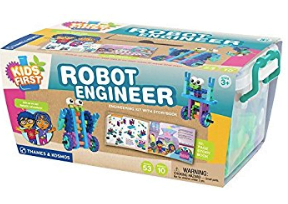 The book includes step-by-step instructions to build each robot, and you can make 10 different ones from the gear included. We think this is an empowering toy for young children because it shows them that they too can create machines that spin, whirl and rotate–just like bigger kids. 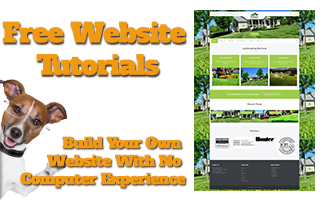 It provides a great basis for learning Science, Technology, Engineering and Math skills. 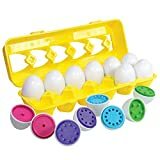 It helps develop fine motor skills, visual-spatial skills, problem-solving skills, hand eye coordination and cultivates concept-building as well. A kid-sized toy vacuum that actually picks up bits of paper and other small objects. It has a window in the canister that provides an intriguing swirling visual in the center. It is easy to wheel around and light enough for your toddler to pick up when needed. 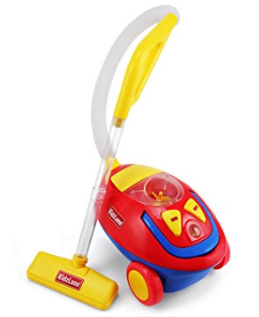 This toy is an innovative update to other toy vacuums because it truly functions as a tool. Kids love to help out, and it gives them a chance to feel successful and actually do that while the importance of cleaning is reinforced. It also develops hand-eye coordination and upper-body strength while children are busily helping their grownups. Your little creator will be so excited to have this remarkable, solidly constructed freestanding tool. There are many ways to use it. There is a roll of paper to draw and paint on, and one side of the eisel is a chalkboard while the other side is a dry-erase board. And when you want to change the paper for cleaning up or for making room for a new drawing, it’s simple to pull the paper through the center to either side of the eisel. 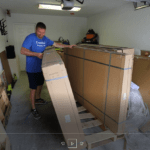 It comes with wide storage trays on both sides of the easel. 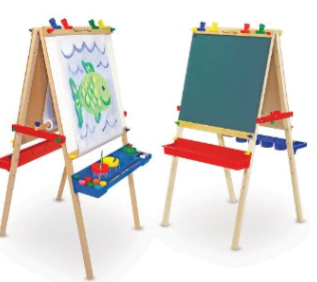 We think this is a fantastic way to develop both fine and gross motor skills: by giving your child the freedom to move around the easel, they will more easily experiment with making colors, try different strokes and scribbles and dabble with an assortment of painting and drawing materials. 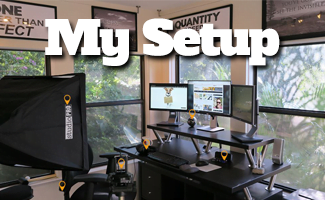 With a spot like this designated especially for creativity, it’s easy to see how kids will be inspired to come up with plenty of ideas and make more and more art!